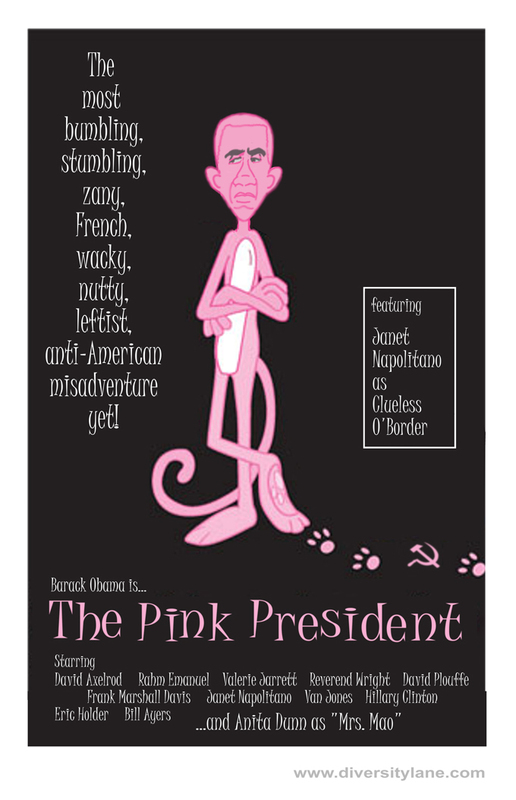 …did those dashing sirens of unspeakable feminine beauty at ‘Code Pink’ cross-breed with the ‘New Black Panther’ party ? I understand the the problem, Zack: our “Inspector” has been trying to hit the ball with the bridge. He’s not leaning far enough to the left although the hammer and sickle was a nice touch. And in color do you mean all reds and pinks? French as an insult, in 2011? Really Zack? Manny, Manny, Manny. I cite le Frrrench motif because the whole damn series is set in France, or at least Clouseau’s certainly set in France. It’s part of the NON-negative aspects; part of the ‘zany, nutty, wacky’ litany. But I can see where you thought I was coming from. vegas, back from the dead! Or the classroom. Are you saying it should be The Red President? That might be closer to the truth I admit, but pink alliterates better. Manny — I submit, heck YES-!! I was made to take 2 years of French in Jr. high school… I hated it, it is the most pathetic sounding language God ever allowed on earth! With one exception in modern history… the people in the French underground in occupied France in the early 1940’s had to grow a set of ‘stones’, for good reasons — they did a darn good job of fighting those Krauts, too. Other than that, I am unaware of anything dignified that country has stood for, in many generations. Years ago, I was living in Northern Michigan, near the Straits of Mackinac (pronounced ‘mak-i-naw’), where a re-constructed fort from the early 1700’s is. Among many flags flown on a series of flag poles, is a plane, all white flag. I asked one of the Park Service Rangers about the ‘who-what & why’, regarding this all white flag. Food, Steve. Modern Cuisine stems from French tradition mostly. The base sauces (bechamel, espagnole, tomato, hollandaise, and veloute, from which many other classic sauces are derived), use of butter, the defining of techniques and recipes… the French are responsible for that. Educate yourself about Marie-Antoine Carême and Auguste Escoffier, to start with. You’re just showing yourself as an example of the ignorant, self-absorbed, American stereotype. I’m not going to dignify the rest of your tirade with a response, aside from that which I already supplied. Zack – Honestly,… I’m not either a ‘Frenchophobe’ however, they are so far down on my tourism priority list, I will have a scenic photo’s of the South Pole, before I get to Paris. Between how rude & semi-hostile they are from Quebec, to mainland France, they are not on my ‘friendly people’ list. And you continue to prove that stereotype. I’ve been to France. They’re nothing like that in any way as long as you dont have a “America is the one and only greatest country on the world!” attitude you’re displaying. Grow up Steve. And stop eating cheese while ypure at it if you hate the French so much. Wine too. Apologies for misspellings. Typing on my ipod is tricky at times. Not just food, but military-speak, comes from French. Half the military jargon lexicon is made up of French words or derivatives of French words. Battalion, grenade, lieutenant, fusillade, pistol, epaulet, brassard, guidon, bayonet, garrison, etc.